It's the vivid colours and bold shapes which make this blue and purple bouquet into something truly wonderful. It's more than just a bunch of flowers - it's an experience. 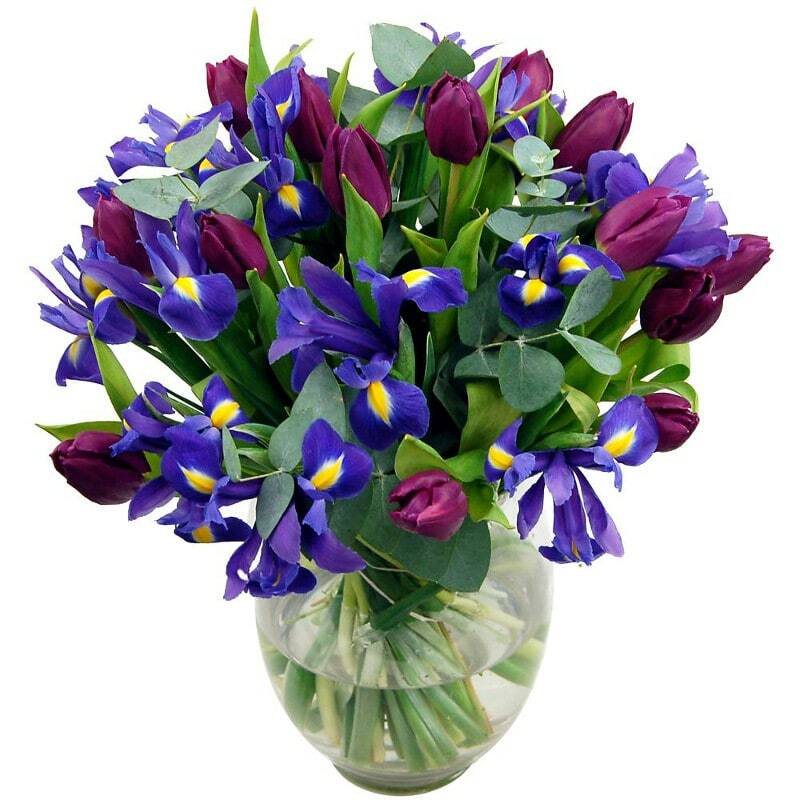 Featuring rich blue irises and deep purple tulips, the Midnight Iris bouquet is waves lapping on a deserted beach at dusk. It's the heady scent of midnight in a summer garden, when flower-petals reach up towards the moon. The strong dark colours of this bouquet make this an ideal bouquet to give as a gift to a man; it is beautiful, without being overtly feminine. The Midnight Iris would also make for an ideal house decoration for a flat which is decorated in a contemporary or minimalist style (if this is the look you're going for, try pairing your Midnight Iris bouquet with some carefully placed bunches of Black Magic Calla Lilies). Like all of our bouquets here at Clare Florist, the Midnight Iris comes with a great range of optional extras - why not add a box of Lily O'Brien's Chocolates to your gift to make it even more special? Or add a handwritten card, with a special thoughtful message all of your own. Whatever you order, your Midnight Iris bouquet will be expertly arranged by our professional florist, and delivered to any address in the UK - with FREE next day delivery! Go Deluxe! Choose this option and our expert florists will add 25% more beautiful flowers for just £3.50!